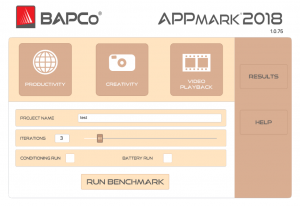 Austin, Texas – December 4, 2018 – BAPCo®, a non-profit consortium of leading PC hardware manufacturers, today released APPmark™, a revolutionary, new cross-platform app-based benchmark that measures performance and battery life with representative modern real-world apps and usage models on touch-enabled devices running iOS, Android or Windows. Apps have transformed how users perform tasks, manage productivity and consume media. Users will commonly start a task on one device and continue that activity on another. Compute power and subsequently productivity is only limited by the device in the user’s hand. APPmark measures performance and battery life and its diverse workloads go far beyond that of evaluations that are solely based on one activity such as video playback. APPmark is a complimentary download from iTunes, Google Play and the Windows Store that is hardware and OS-agnostic. Its results are comparable across platforms. Users seek devices that are responsive as tasks can then be completed faster; this leads to greater engagement and enhanced experiences. Unlike benchmarks that measure battery life or performance in isolation, APPmark measures battery life and performance simultaneously, showing how well a system design addresses the inherent tradeoffs between performance and power management. In addition, APPmark can also be run in performance only mode for those seeking fast test that provides a performance only metric. The searchable online results submission feature allows comparison between devices and those submitted by other users. Unlike synthetic benchmarks, which artificially drive components to peak capacity or attempt to deduce performance using a static simulation of application behavior, APPmark measures platform-level user experience, using the same platform APIs and services used by third-party app developers, real user workloads and real data sets to accurately measure how overall system performance impacts real-world user experience. 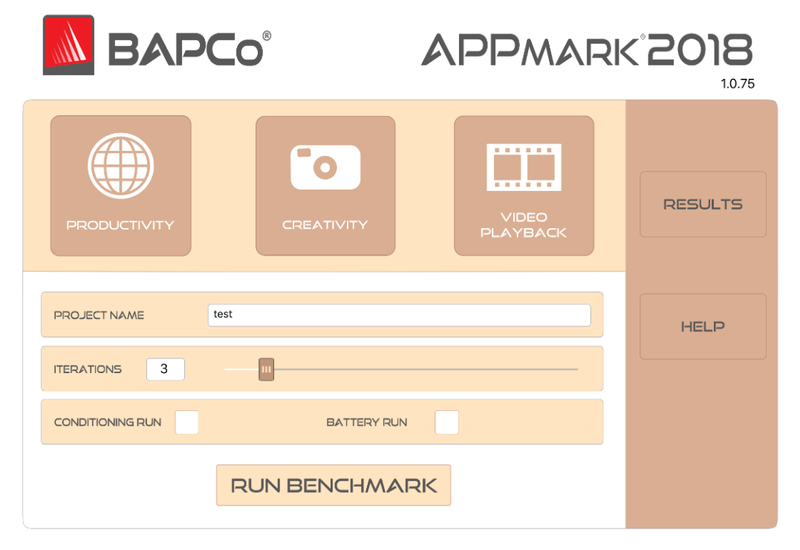 APPmark joins the BAPCo family of benchmarks, alongside SYSmark® and MobileMark®, which have been widely accepted for 27 years by IT Managers, PC OEMs, press and analysts worldwide. Since 1991 the BAPCo family of benchmarks has been used by PC OEMs, hardware and software developers, IT departments, system integrators, publishers and testing labs as well as information technologists and computer industry analysts. BAPCo’s membership development team represents the breadth of the computing industry and harnesses a consortium of experts. APPmark is a complimentary download available from iTunes, Google Play and the Windows Store. Just search for “APPmark 2018” on your device’s app store. Business Applications Performance Corporation (BAPCo) is a non-profit consortium of leading independent testing labs, PC hardware manufacturers, semiconductor manufacturers and software publishers. BAPCo, SYSmark and MobileMark are registered trademarks and APPmark is a trademark of the Business Applications Performance Corporation. All other names mentioned are trademarks, or registered trademarks of their respective companies.